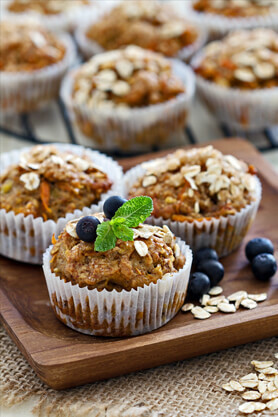 Vegan muffins, packed with delicious healthy goodness! Based on a recipe originally found on lunchboxbunch.com, Taylor swapped in Arbor Teas Organic Masala Chai Black Tea to create a new, SUPER chai muffin! Preheat oven to 350 degrees. Line or grease muffin cups. Boil 1/2 cup water. Steep 2-3 tsp Organic Masala Chai Black Tea in the water for 5 minutes. Strain out tea leaves. Then add the chia + flax seeds to the tea. Stir well and set aside for a few minutes. Add in the wet ingredients. Stir well - batter will be very thick at this point. Fold in the tea + seeds to loosen the batter. Fold in the berries and nuts. Pour batter in muffin cups and bake at 350 degrees for about 18-22 minutes - a bit longer if you use very frozen blueberries.